Here are some of my favourite and most useful sites. Great things happen when developers work together—from teaching and sharing knowledge to building better software. Some favourite web design tools. Oiko CSS editor is a visual CSS editor with easy-to-use interface and graphic tree-type view of attachment files and the CSS structure. Content management systems to make building and maintaining websites easier. The home of WordPress and the official download website. 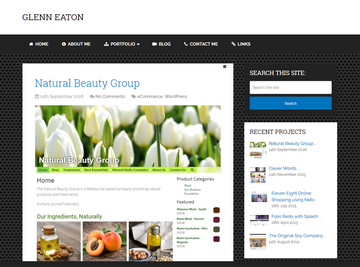 The first CMS I started with but I have now moved onto WordPress. Here are some great sites to get started with Joomla! There are also heaps of modules and plug-ins to choose from as well. Documentation about Joomla for developers. The complete solution for your membership and social networking site. A great source of professionally built templates and modules. A networking module for Joomla. Very similar in appearance to Facebook. An excellent e-commerce solution for Joomla. The WP eCommerce Plugin is everything you need to sell anywhere! A powerful ecommerce platform with a difficult learning curve. The best FREE and open-source eCommerce platform Everything you need to create, scale and run your business. Oscommerce provides the tools to set up your own online store and website for free. Excellent source of free stock images. Source of free stock images. Websites I have built for businesses, clubs and churches; and some for myself. First personal website, this was my first home site which is now replaced with this one built with WordPress. My first online portfolio to showcase my work. This new one has replaced it using WordPress. 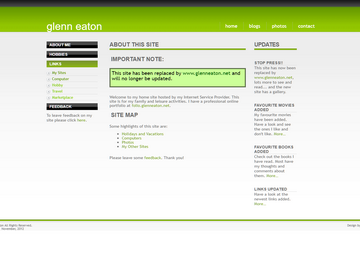 A website to showcase Web and VB.net achievements for Glenn Eaton. AEFA, An Australian Organisation Fostering And Promoting Aeromodelling Using Electric Power. 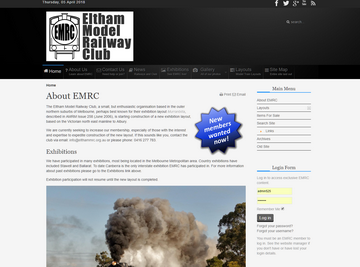 My first Joomla site for my model railway club. The site features a gallery with many photos of the club’s exhibition layout Murranbilla. SAM600 is a group of Victorian modellers who build and fly old model aeroplanes. Support for home educators in the greater Sydney area. Judy Doubas formed the idea for Ten for Tamils when she first visited Jaffna, Sri Lanka in October 2014. Founded in 2013, Theatre 451 produces both new and known works of Australian and International theatre in the northeast Melbourne region and on tour. Welcome to Whittlesea Presbyterian Church. Websites I have built for businesses and other organisations. My first commercial site done for my Certificate IV (Programming and Networking) at Greensborough TAFE. Courtney has been mad for motorsport right from when she could walk, always wanting a faster mode of transport. Established in 1985, Dolphin Distributors is a wholesaler of a range of Healthy Breads and products. An information site for Central Highlands surgery in Ballarat. An artist who specialises in creating art from old industrial parts. 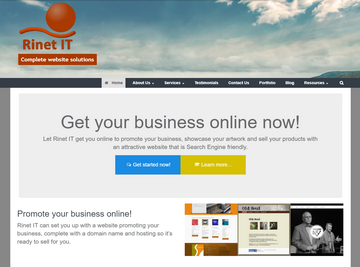 My own business specialising in Web and Application development. Taint Stainless are stainless steel fabricators from the design to the completed product. Topline Tennis website, we have been the No.1 tennis coaching in the north eastern suburbs. Viewbank Tennis Club has 23 adult teams playing in the NENTG and HDTA competitions and 16 junior teams playing in the NEJTA competition. 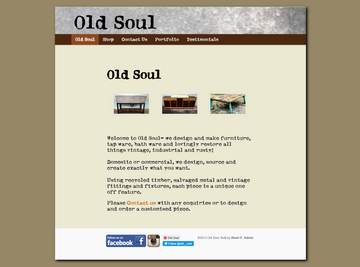 Websites that have moved on from my business. A large commercial laundry who provide services from private customers to large corporations. Some PHP frameworks that are worth trying out. CakePHP makes building web applications simpler, faster, while requiring less code. Zend Framework (ZF) is an open source, object-oriented web application framework implemented in PHP 7 and licensed under the New BSD License.